I gave a lecture this week on Disney's The Little Mermaid, and as part of that lecture, I talked about the possible inspirations for Hans Christian Andersen's fairy tale version of the story. Friedrich de la Motte Fouqué's novella Undine is one of the likely texts that Andersen drew from, and as I was working on finding images for my slideshow, I came across the illustrations for the 1909 English translation of Undine, drawn by an English illustrator named Arthur Rackham. What I am most drawn to in Rackham's work is the "haunting and dreamlike style" of his illustrations, as the website Art Passions describes it. 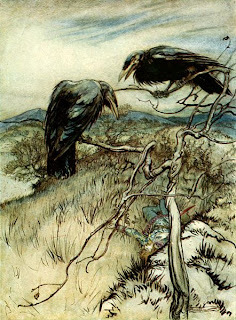 For me, the haunting nature of his style has a lot to do with the way he applies color--rather than using solid, bold colors, Rackham used multiple washes of color to create "transparent tints." It gives the impression of his images both being there and not being there, just like ghosts and dreams. 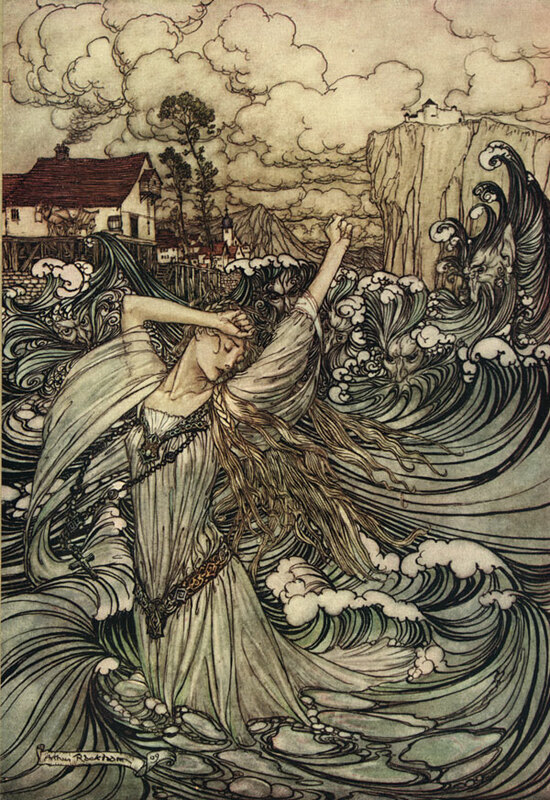 This dreamlike style of illustration fits in perfectly with the majority of his subjects--Rackham draws a lot of fairies, magical creatures, myths and folk tales, scenes from Wagner's operas, and, as seen in the image below, Rip van Winkle. If you like Rackham's work, Art Passions is a fantastic resource--this site has an impressive number of Rackham images, as well as a helpful list of the wide variety of things that he has done illustrations for. Here is an illustration from Some British Ballads called "The Twa Corbies" (The Two Ravens). 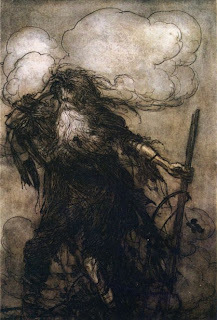 This piece highlights another feature of Rackham's work that I'm really drawn to: his skies. These skies aren't the bright blue skies of a sunny day. No, the muted tones of his transparent tints and the sepia coloring of much of his work create skies that are reminiscent of what it looks like when it's going to snow. These skies are haunting, and a bit discomforting, but most importantly, imbued with a sense of magic--just like Rackham's work.